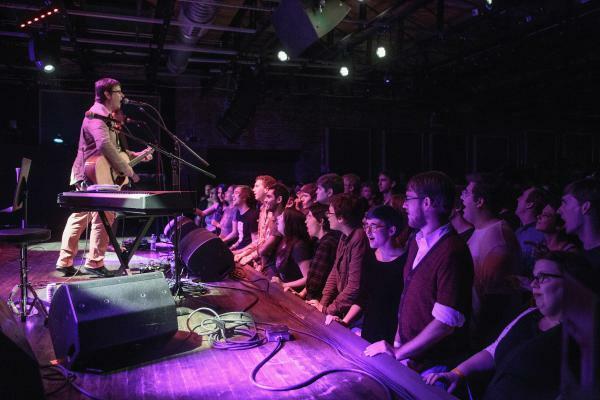 John Darnielle performs with The Mountain Goats at a 2015 concert in Birmingham, Ala. 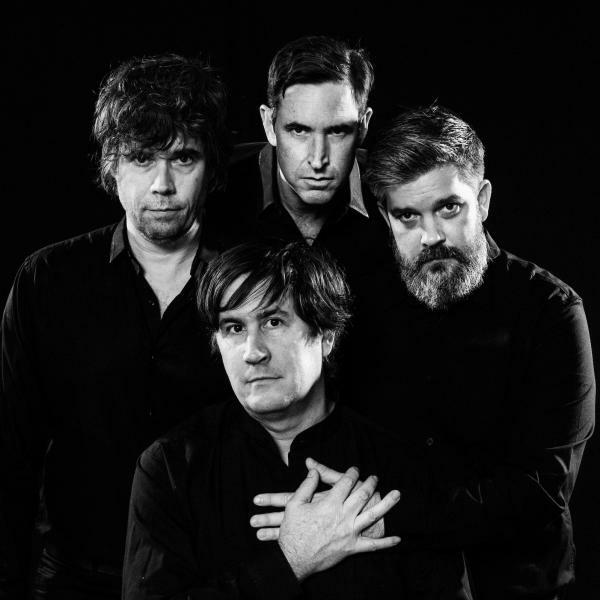 The present-day Mountain Goats, clockwise from bottom: John Darnielle, Jon Wurster, Peter Hughes, Matt Douglas. The first time you hear it, you're stunned: "I hope you die." You wonder if you heard right, and a moment later you get your answer: "I hope we both die." Released in 2002 on the album Tallahassee, "No Children" is perhaps the best-known, most enduring song by The Mountain Goats, the prolific songwriting project of author and musician John Darnielle for over 25 years. But more than that, it has found a place in recent history as an anthem to dysfunction, able to unite listeners in a sentiment that makes you gasp and laugh all at once. Up to the early 2000s, The Mountain Goats' music was the definition of a cult taste: A nasally voice and bare acoustic guitar, often recorded on a department-store boombox, which wrapped Darnielle's lonely characters in a blanket of tape hiss. Tallahassee was a turning point: Tracked top to bottom in a real studio, with a dedicated backing "band" in multi-instrumentalist Peter Hughes, and released by the storied British indie 4AD. It even had a defined narrative arc, tracing the crumbling marriage of an addict couple, whose story had been hinted at in songs scattered over The Mountain Goats' first decade. When I reached Darnielle at a studio in Durham, N.C., where lives with his family, he said the plan was to give these damaged characters the broad stage they seemed to be yearning for. "I would really dwell on their desolation," he explained, "and have them celebrating the hard, ugly parts of the time before divorce." With a tinkling piano riff and a bobbing rhythm, "No Children" announces itself as the centerpiece of that story, as one character simultaneously vents frustration, admits defeat and revels in failure, all from the very first lines: "I hope that our few remaining friends give up on trying to save us / I hope we come up with a fail-safe plot to piss off the dumb few that forgave us." Though the band rarely performed it at first, requests from fans helped turn it into a live staple. Within a few years it had become something more. Search for live recordings and you'll hear entire rooms shouting its searing chorus. Poll the fanbase and, amazingly, you'll find couples who claim it as "our song." Lyric tattoos are not unheard of. Joseph Fink, creator of the powerhouse podcast Welcome to Night Vale and a Mountain Goats superfan, says the song finds its power as a vessel for catharsis: "I suffer from anxiety, and one of the most helpful things I've learned is that if you fight anxiety, if you start to feel yourself going into a panic attack and you try to stop it, that makes it worse," he explains. "['No Children'] is a song that says, 'No, I just want to stay in this painful moment. I just want to feel this painful moment, and take joy in how dark we can make this moment.' "
In the years since Tallahassee, Darnielle's life has changed. His band has swelled to a four-piece, with a well-received album every year or two like clockwork. He's published a handful of novels, been interviewed by Terry Gross and Marc Maron, had a beer named in his honor. He has two children. More recently he's been the subject of Fink's latest podcast, I Only Listen to the Mountain Goats, on which the two dissect his work song by song. But even now, he admits he's never created anything quite like "No Children" — a breakup song so dark it's funny, in whose jagged refrain you can't help but hear a little of yourself at your very worst. As part of NPR's American Anthem series, I asked John Darnielle to explain just where "No Children" came from — and what it's been like to watch a generation of fans elevate and embrace it as anthemic. Daoud Tyler-Ameen: Can we start with what "anthem" means to you? The American Anthem series has a working definition: "a rousing or uplifting song identified with a particular group, body, or cause." But in the music industry, it's also kind of a buzzword. John Darnielle: Sure. If I were to open Spotify I suspect I would be able to find a playlist called "Anthemic Indie." That's a whole separate genre at this point — and it means that it's mastered very hot and that someone says "whoa-oh, whoa-oh" at some point, which is not anthemic. The notion of the anthemic predates that, and it's a weird hijacking of the concept. An anthem stands in for something. It's like a flag: It's emblematic, but it's emblematic in sound rather than in vision. If we have an anthem, then we can lock into the same feeling and the same shared set of ideas about something. I mean, this is not actually what happens: If we all sing the national anthem together, we probably have different feelings about it. But the idea is that anthems are sort of a shared codex for sentiment, that people can sing together. Which may not have been what you had in mind when you wrote "No Children" 16 years ago, but I would argue it fits that definition today. Tell me how that song, and the album Tallahassee, came about. When 4AD got in touch with me in 2000, they asked — as labels who are getting ready to pay for a studio budget do — "What would you want to do with your album?" And I wanted to come up with a pitch that would encourage them to want to sign us, because we'd been trying to get a little more widely known. And I said, "Well, I have these characters I call the Alpha Couple." I was sort of following poets that I liked who have characters that they return to again and again, especially John Berryman. I also was rooting this in the fact that, for the people I grew up with in Southern California, divorce was a more common reality when we were children than it was for people elsewhere in the country. If I knew somebody whose parents divorced when they were 14 or 15 I would think, "They should have gotten it out of the way when you were younger, so you wouldn't remember as well." So I was sort of delving into my thoughts and feelings about that, building characters, and having many alternate timelines for them. Sometimes they say they have children, sometimes they don't. I spent, six, seven, eight months writing the songs, looking at old notebooks, trying to find what the thread would be. "Taking a geographical" is a term from recovery where you think, if I go somewhere else, maybe that will fix my problem. Which, of course — if you are an alcoholic in Claremont, you will also be an alcoholic in Portland. The phrase in recovery is you can't run away from yourself. And I thought, "Well, I should get them to Florida." They were trying to run as far away from California, where they were from, as they could — and the idea was, they get to Florida and run out of land. So they set up in Tallahassee. Midway through the writing, I'm thinking about what defines their life down there, and I thought, "Do they have kids or not?" At this point I had enough of the new songs to go, "No. Under no circumstances do you put children in these people's lives." I was working with children at the time, so I knew more about children than I had when I was writing the original songs five or six years earlier. I was a counselor for Lutheran Social Services at a placement for kids who, for whatever reason, weren't with their parents. This wasn't a locked facility — our kids went to school, and we would take care of them in the morning and the afternoon — it was the ability to provide structure and care and love. We talked openly about, "Love these kids as hard as you can, because a lot of them haven't had that." So "No Children" is set within both of those things. I'm caring a lot about children — that's where the title comes from. And I'm feeling some of my characters' glee. But I'm also placing myself in a position of judgment, trying to make sure that the fact that these are not people you want to be around is clear. Sure. Although you chose to be around them for "six, seven, eight months," as you said. And for the rest of my life! I have them inside me. But that's the balance. We love the Wicked Witch of the West, but she lights people on fire. That's the tension of character, in general: We want a place to safely indulge parts of ourselves that we would never in our lives, or hope not to. I'm always dwelling on that tension, because I think you get the better version of it if you're conscious of the damage these people do. I haven't gotten to do it in a long time, because this song has moved through the world and become better known — but as a fan, for the first few years after Tallahassee came out, it was fun to play this song for a friend for the first time and watch their face change. The severity of it doesn't hit you right away. Right, because of the melody. And the arrangement! Most of your recordings up to that point had just been guitar and voice — but then here comes this barreling, old-time saloon piano. Well, that's Franklin Bruno; I can't take credit for that. He came in around day three or four and started laying down stuff on the basics that we'd put down, and that piano was his contribution. It's not an indispensable part of the song — we do it with just guitar and bass, or I do it with just guitar — but it is absolutely part of the song's identity. Did it change things in terms of thinking about how you were going to perform it, given that the live band back then was just you and a bass player? Did you have a moment when you heard it where you were like, "Ugh, that's so good. Why are you making things difficult for me, Franklin?" Well, here's the thing. I thought it was really good, [but] I said, "We're not gonna play that one live. It doesn't really lend itself." I don't remember playing it more than once or twice on that tour. I mean, I kinda wanted to — but you know, the album hadn't exactly blown up the world. If you look at our set lists from that tour, you'd probably laugh at how little we're trying to sell the record. According to setlist.fm, in 2002 it was played twice. [In 2003] it was played six times — and 2003 was a big touring year. In 2005, eight times. And that's when we really started hitting it hard. It becomes a staple around 2007. And by then you've added Jon Wurster on drums — who people might also know from the band Superchunk. And once Jon got in, [we saw] the possibility for opening it up live. The beat is in 6/8 — bum-budduh-bum-bum, budduh-bum-bum. It's got a chantey feel to it. When you hear that with the drums, it really does encourage you to sort of raise your glass and sing along. So tell me what happened, in terms of reception, when you did start to perform it. I knew that people liked it. During the days of the smaller tours, playing to 60, 70, 80 people, I remember specific people coming up to request it, who were already quite drunk. We were playing in places that didn't have dressing rooms at the time, so I'd be hanging out at the bar. And somebody would come up — it'd be a man and a woman, and they'd both be pretty into their cups — and they'd say, "Hey, you gonna play 'No Children' tonight? That's our song!" I have a counselor in me, and I'm a caring person, so I want to go, "I hope it really isn't. If that's your song, it won't be your song together for long." I would feel kind of over-concerned. And yet, pretty soon it becomes a sing-along moment in your set. I've heard live bootlegs where the whole room is shouting so loud that I can barely hear you. [Laughing] I know. It's awesome. Oh, yeah. It can be whole festivals. It's a blessing. The first time that happened, actually, was when I was sick at a show at [the Bay Area venue] The Bottom of the Hill. If you're in an indie rock band and you get sick, generally you don't want to cancel. People have been planning on it, people are looking forward to having a good time in the midst of their work week. Also, we don't have a kill fee: If we don't show up, none of us get paid that night. I think I had gone to a vocal doctor at UCSF to get some steroids, but they don't kick right in away. I had very little voice left, and I remember people yelling for "No Children." I had put together a set with quieter songs. I was like, "This is a song that I can't really do for you tonight. You guys should sing it." And they did. And I could hear this glee. When I'm playing sick I'm worried I'm going to mess up my voice — that's a constant stress. This cheered me up. It felt really good to hear. It seems to me that in the early part of your career, you knew you were doing something a little esoteric. There's not a lot of rousing choruses built to transcend space and time on the early cassette recordings; it's very much like, "This is a guy in a room doing a purposefully weird thing." Did it surprise you to find you could write a song that a roomful of voices could inhabit? I would say no. There's a song on the first Mountain Goats tape called "Solomon Revisited Revisited," whose chorus was "I've got a radio." It was a perverse, anti-anthemic idea, this song about a guy who has fled to the woods to recover from some romantic wrong, but he's insisting that everything is fine because he's got a radio. To me, that remains one of our most anthemic songs. We opened for Sebadoh in '94 at The Roxy in Los Angeles, and I was absolutely firm that we had to play that song so I could make as many people as possible say, "I've got a radio." It's funny to me to have people singing a line that is not something you'd expect to hear them sing. But the notion that I could sing something that became more generally anthemic, [yes]. Because "No Children" is one of those songs that people who don't care about The Mountain Goats still hear and like and get into. That band is fine, but hey have that one song I love where he says, "I hope you die." "I've got a radio" is never going to reach a broader audience. 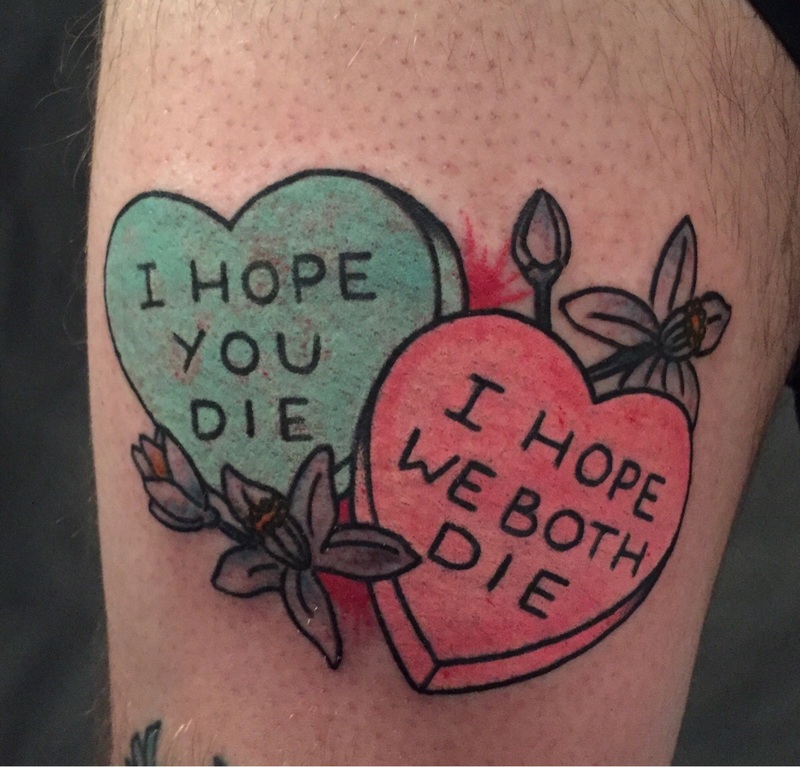 "I hope you die" reaches an audience of people who didn't know they needed it. It's found its way to a lot of other musicians, too. Julien Baker, a really wonderful young songwriter, covered it live this spring, which was caught on video. Oh, it was the best version. It was the best version. Well, a cover should unearth something in the song that the original performer failed to unearth. There was a profound tenderness in that version, and it made me feel sad for the characters. To unearth that note with such strength, as she did, with such clarity and such patience, is the thing. Tallahassee is not a patient album. "No Children" lands with the riff, and the first thing you hear is me at full pitch: "Let's get this song done on the first day of tracking so I can get 100 percent of my voice on it." Her song just sort of bleeds into the room. It resolves from a fingerpicked style, that I wouldn't be capable of playing. It lets the melody amble in. My version hammers you with a bunch of words. Her version lets the words bear their own weight, so by the time that you get to the punchline, you wish them well. You want them to get better. It's been a minute since this song came out — more than 15 years. In that time, the language and understanding around mental health and counseling and support has changed a little bit. Has that changed the way that you think about writing troubled characters? Does it make a difference that people today are ever so slightly more willing to talk about things like therapy and recovery in public? Because the thing about the Alpha Couple is that they seem so utterly beyond help. I mean, I think I've grown over time. I have a broader palette to draw from. But for these characters, what makes them good, if they're good at all, is how unapologetic they are in their disease. They don't make any apologies for who they are. If they care about the people they hurt, it's in the privacy of their hearts. And I think that's good: It's kind of dishonest to one's characters to force them all to have some redemptive note. But that is the surprise to me with these characters: Many people are perfectly happy for this unredeemed, self-destructive couple to be in their own black hole of self-hate. It's sort of this darkness that eventually glows with its own power. Which, I suspect, if you've ever dwelled on some resentment long enough, you know that they all do have their own little glow. In a song, or in a painting, that's the right place to sit with that — situated in a safe place, where it won't actually hurt anybody. All these years later, do you imagine a song like "No Children" as for somebody? There are certain kinds of songwriters who do a lot of preamble when they perform, and they'll say things like, "This song is for anyone who's been in an abusive relationship and decided enough was enough." Do you think about it that way? On given nights. I don't think of a song as being possessed for all time, because it doesn't have a text. There's a recording, but songs live in performance, right? When you play it, you can change it, or it can be a different audience, or you can be be playing it for a different reason. On a miraculous night, where it's visible that you're going somewhere with it that is new to you, the audience and you can meet on that ground: They can connect to that and be co-authors in that moment. But with "No Children," given that the song's been around for a little while, we're also sharing the story of the song, something that we've sung many times in many different moods. People who have been to lots of shows are re-engaging a process of performance with me. That's what makes an anthem, is that we're all sharing it. The person singing the anthem is not just singing it; they're encouraging someone else to sing along. I don't say to sing along, because I don't have to — it just happens. And that moment of the erasure of the self of the performer, that is what the real joy of performance can come to be about. Kristy Guilbault provided production support for this story. Special thanks to Chris Bellew for the use of his recording of The Mountain Goats' 2006 Bottom of the Hill performance of "No Children."